Welcome back once again to all my fellow City Daily Photo bloggers making your rounds during the June theme day of reflections. In all honesty, this photo was an accidental capture. I somehow must have click the shutter button and captured my son while playing on a beach in Bemidji. Up until now, I've never show this photo to anyone, I thought it was a fitting photo for the reflections theme day. Lucky for me eh? This is similar to mine! A unique photo for the theme and very heartwarming too. This is one way to keep an eye on the kids! Great for Theme Day. How fabulous Steve. 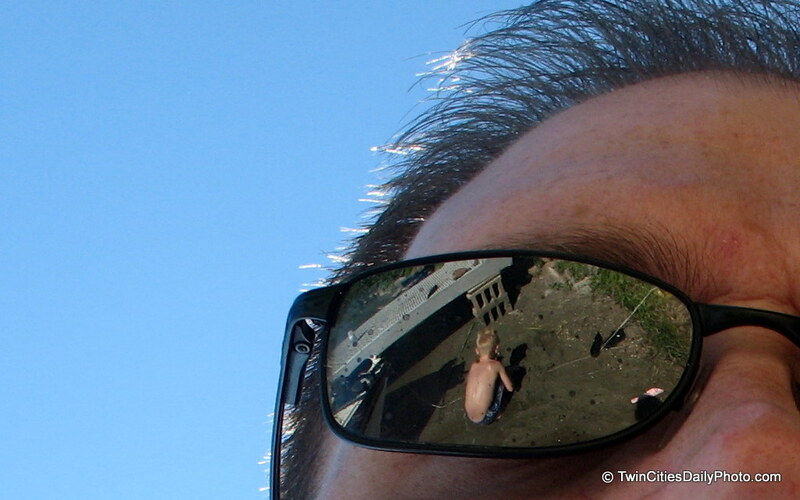 The reflection is super but so is the detail in the hair and that blue sky. Don't you think that sometimes the best photography is accidental? Sometimes we get luck. You got it here. Jilly, I agree accidental photos can turn out surprisingly well at times. I must also say, I cropped this photo down a bit, otherwise, you would have a nice clear view up my nose! Steve, how cool is that! Besides being perfect for July's theme, the shot itself is a stand alone father and son shot. It just speaks volumes to me metaphorically and is such a tender image. You could be looking back on your own childhood with your dad, looking into your son's future with his kids, just enjoying the moment of reflection on your boy playing. . . it's endless. This is more than just a theme day shot. It's a lifetime keeper. And technically a great shot, too. . .so amazing it is accidental. Exquisite. The apple of his dad's eye.